In what promises to create better communication networks, researchers have found a method that removes the need to convert light signals into electrical. Optical fibres transmit data at light speed but to perform routing and data processing light signals have to be converted. The new process uses vapour-filled optical wave-guides built into silicon chips to process data streams encoded on light. This enables the optical signals to be slowed and transferred to the chip, processing data directly in PCs. Stop worrying about bringing germs of cough and cold back home. A new drug can prevent viruses from spreading through the air. When people cough in public, they spew millions of tiny droplets which hang in the air for minutes, even hours. Inhaling small amounts of drug dextran changes the mucus in the lungs. The tiny drops clump together. This suppresses their emission. Triclosan, an ingredient in soap, can be the key to treating a parasitic infection affecting two billion people. Toxoplasmosis is spread by Toxoplasma gondii through contact with faeces of infected cats and eating raw or undercooked meat. It can damage eyes or kill people with poor immunity. It has been found that triclosan blocks a key enzyme that the parasite uses to live. Current drugs have side-effects. Triclosan cannot be used as a drug, since it does not dissolve in the blood but it’s molecular structure can be the basis for future medications. Tweaked mice may hold the clue to treat typhoid. The model is based on transplanting human immune stem cells from umbilical blood into mice. 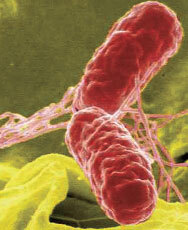 Salmonella typhi, responsible for typhoid, is highly adapted to people and has evolved ways to evade body defences. Normal mice are resistant to Salmonella, but the bacteria are able to reproduce in the mice that receive transplanted cells. It is the first model to study typhoid and will help determine genetic factors that make people susceptible to the disease. Behavioural demands of living in a group can have varied impact on the brain size. Researchers found that desert locusts have different brain size according to lifestyle. In low population densities locusts occur in a solitary phase and have 30 per cent smaller brains than their gregarious counterparts which aggregate into dense migratory forms. Larger brains can be attributed to more integration for foraging and living in swarms dominated by competition. In solitary locusts parts of the brain associated with vision and smell are larger to help them locate distant stimuli. A nanoparticle-based catalyst can help refineries make green gasoline. Researchers have found that subnanometre clusters of tungsten oxide on top of zirconium oxide are highly efficient as a catalyst. In petroleum manufacturing catalysts are used in the chemical process for refining hydrocarbons. The research showed subnanometre catalyst turns straight-line molecules of n-pentane, one of the many hydrocarbons in gasoline, into better-burning branched form. The catalyst also removes wasteful products like solvents and other chemicals. It reduces the amount of energy consumed and spend in the process. Geologists have unravelled a mystery in earth sciences: what led to the formation of igneous rock structure in Siberia. They were suspected to be a massive set of lava flows. 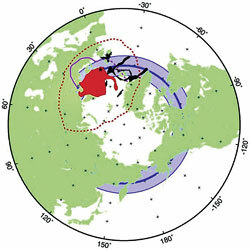 Now geologists have shown they formed when Siberia drifted over the Earth’s mantle now underlying the North Atlantic region. It is a rocky, solid layer about 2,800 km thick between the earth’s crust and its core. While writing the theory of visual communication, Darwin seems to have missed the role played by patterned feathers to attract mates in birds. Now a study shows that such feathers, previously thought to be used only for camouflage, can play an important role in attracting mates and fending off rivals. The researchers found that barred plumage was more likely to appear in males, or at sexual maturity, compared to other patterns. The findings will provide a better understanding of animal communication. Indian scientists have developed genetically modified commercial potatoes, turning the carbohydraterich source into protein-loaded tuber. The new variety called protato contains 60 per cent more protein and increased levels of amino acids than natural ones. It was created by introducing a gene, AmA-1, from the grain amaranth, a South American plant widely eaten across the tropics and rich in protein. Later it was linked to a DNA code that turns on production of the storage protein in tubers. The potato can act as a nutritive source for people with protein deficiency, who consume it as a staple. A new satellite-based map gives an insight into the amount of air pollution globally. The scientists studied the concentration of fine particulate matter in the air between 2001 and 2006. These particles are known as PM2.5 and their size is about 10th the width of a human hair. They can easily penetrate deep into the lungs.